This month Radio Shack is testing the waters for a return to its roots and the DIY revolution. 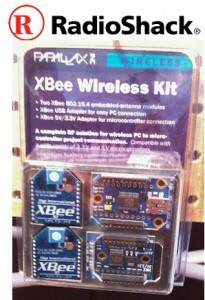 Parallax is supplying 500 stores across the country with XBees and other maker-oriented components. Arduinos are being supplied directly by the manufacturer*. If sales take off, the distribution will extend to Radio Shack’s 5,700 company locations and potentially to 4,500 other independent dealers. This is an amazing opportunity to bring the innovative power of rapid prototyping directly to a broad audience of students, inventors, educators, weekend tinkerers and professional engineers. Here’s a complete listing of the Radio Shacks with XBees, Arduinos, etc. If you’re near one, then a visit along with a purchase could help put the wheels in motion for countless creative components to be available nationwide. Check the list and go! What time period exactly is “This month”? October ends in a couple of days, so I’m guessing it’s not October. “This month” is indeed October. Materials were set to be in the distribution channel about 10 days ago, so they should be showing up in the test market stores soon if they haven’t already. Parallax is not supplying Arduinos to RadioShack. Being able to go down the street to buy components will be very welcome, though I really like Sparkfun and the other online retailers. Maybe some day the level of immediate service and expertise a physical store can offer will be added on top of selling components. So which stores? any in the Greater Washington DC Northern Virginia area? I have been using Arduino and having a local source would be interesting. Check the list link in the post.